This 4 storey, 2 bedroomed town house is situated in the historic centre of Prades. It has 2 double bedrooms, one with an ensuite toilet and washbasin. There is a double fold out futon in the TV room. 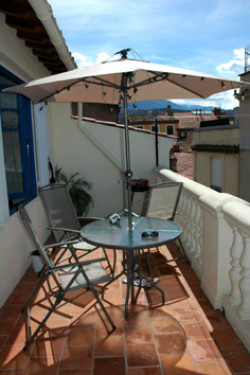 The roof terrace is overlooking the town and Mount Canigou. It has garden furniture including chairs, table & parasol. There is also a BBQ. The upstairs TV rooms opens onto the terrace. The house has been recently decorated with lovely new furniture, stripped wood floors, high ceilings, fire places and lots of original features. The village has many local shops including bakers, butchers and a number of bars and cafes in the town square as well as scattered throughout the town.